Osgood received the honor in recognition of his numerous contributions to integrated optical devices and design. In recognition of his numerous contributions to integrated optical devices and design, Richard M. Osgood, Eugene Higgins Professor Emeritus of Electrical Engineering and professor emeritus of applied physics, has been named a 2015 Fellow of the National Academy of Inventors (NAI). Among the most prestigious distinctions accorded to academic inventors, the recognition honors leaders “who have demonstrated a highly prolific spirit of innovation in creating or facilitating outstanding inventions that have made a tangible impact on quality of life, economic development, and welfare of society.” Just 582 innovators nationwide are NAI Fellows, nominated by their peers for remarkable contributions to technological progress. Collectively, the NAI fellows hold more than 20,000 issued U.S. patents. Osgood is an internationally renowned researcher whose specialties include new classes of lasers as well as understanding the dynamics of their material medium, the physics and applications of laser surface interactions, solar cells, linear and nonlinear Si integrated optics and physics, the electronic structure of low dimensional materials and nanostructures, and computational electromagnetics. He has published nearly 500 research papers, written a book, edited several anthologies, and received 23 patents. He and his lab group have been involved in numerous startups focused on optical materials and materials processing, including the photonic design system RSoft that was later purchased by Synopsys. 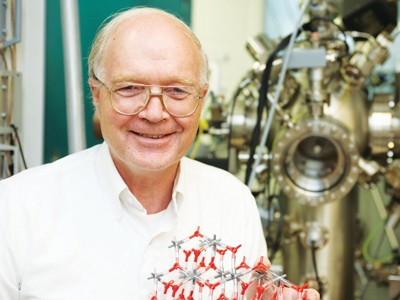 A member of the Columbia Engineering faculty since 1981, Osgood cofounded the Columbia Microelectronics Sciences Laboratories (MSL), co-directed the Columbia Radiation Laboratory (CRL), and headed up the Columbia University Center for Integrated Science and Engineering (CISE), now the Columbia Nano Initiative. He took a two-year leave of absence beginning in 2000 to serve as associate laboratory director for energy sciences at Brookhaven National Laboratory, where he oversaw the National Synchrotron Light Source II, the Center for Functional Nanomaterials, and wide-ranging research in chemistry and materials science including condensed matter physics. Osgood joins fellow Columbia Engineering professors who have been inducted to the NAI in recent years, including Dimitris Anastassiou, Charles Batchelor Professor in Electrical Engineering; Kam W. Leong, Samuel Y. Sheng Professor of Biomedical Engineering; Shree Nayar, T.C. Chang Professor of Computer Science, and Gordana Vunjak-Novakovic, The Mikati Foundation Professor of Biomedical Engineering. The new class of NAI Fellows will be inducted April 2016 at the academy’s annual conference, to be held at the U.S. Patent and Trademark Office in Washington, D.C.